I am a busy mom to four and I am completely obsessed with all things house and home. 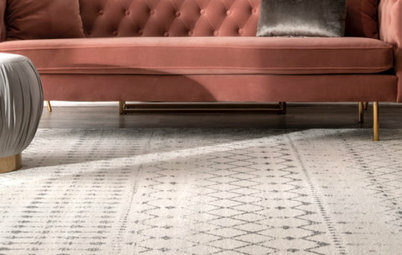 I have an eye for pretty and love to write about making beautiful and livable spaces at my blog www.shabbynest.blogspot.com . It's that time of year again: spring cleaning. Which also happens to be the perfect time to organize your linen closet. With all the towels, sheets and various sundries that fill their shelves, things can become a jumbled mess in there rather quickly. 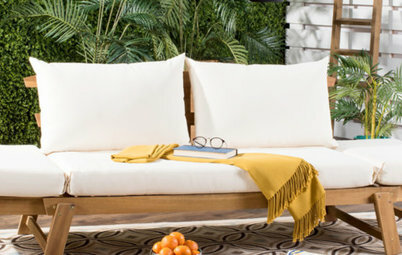 So here is a collection of pretty and practical inspiration to help you get — and keep — those linen closets organized during your big spring clean. 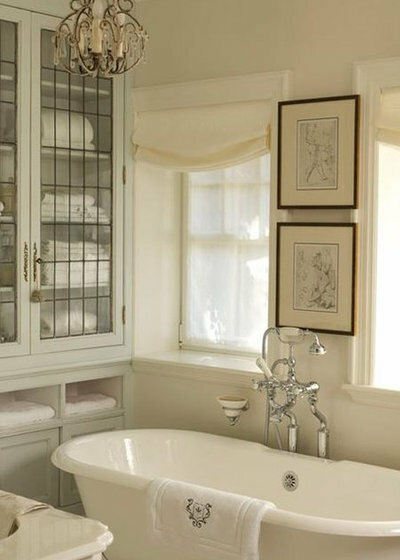 Perfectly suited to this pretty bath, the compact linen closet offers both enclosed shelves and visible drawers for a mix of much-needed storage. 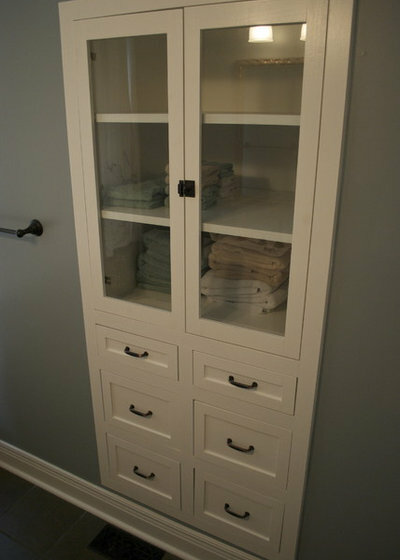 A traditional armoire is perfectly suited to act as a linen closet in a storage-deficient house. The combination of bins, bags and baskets in this linen closet allows for a cohesive look while accommodating the various odds and ends that can be difficult to store. 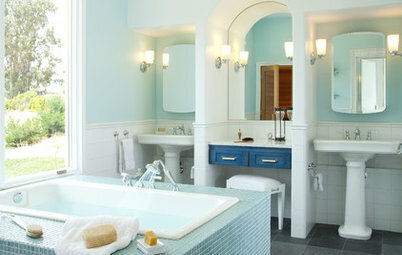 Tell us what spring cleaning project you're tackling this weekend on the Houzz Facebook page! No more need to pull out everything just to see what's behind. 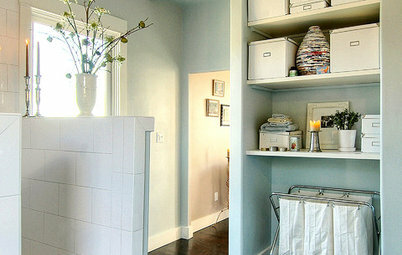 Shallow drawers set on tracks allow for easy access to linens stored in the back. 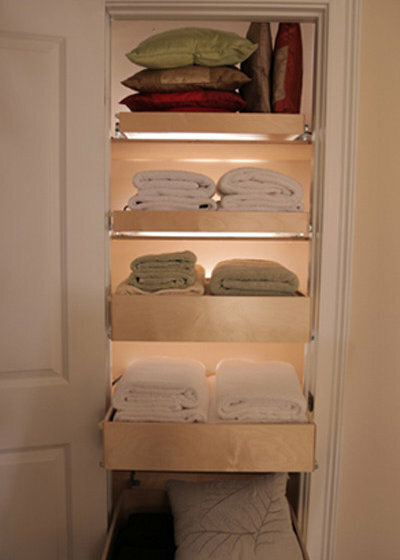 Under-shelf lighting is another clever way to help keep a closet's contents easy to find. 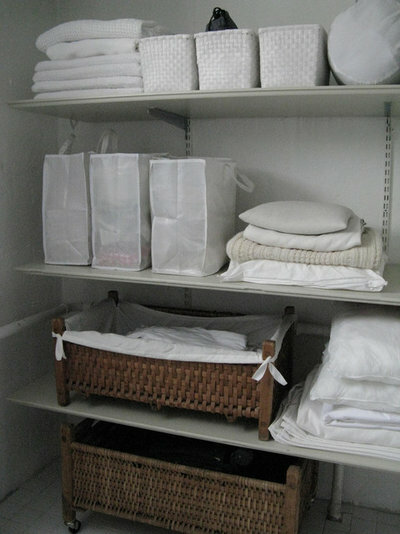 Linen storage need not detract from the look of your home. 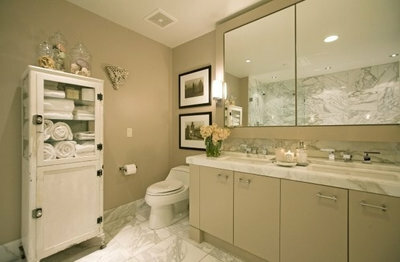 Take this bathroom, for example. 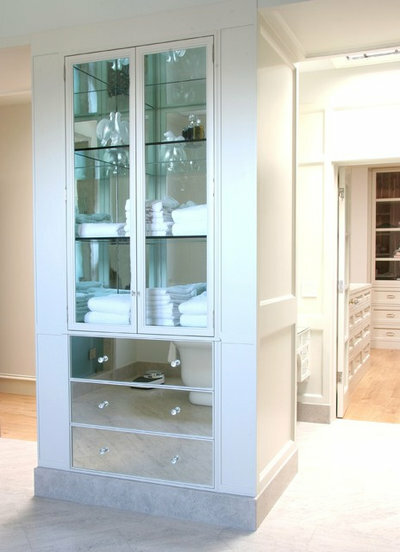 Here, the closet becomes a fabulous focal point with the addition of unique glass front cabinetry. 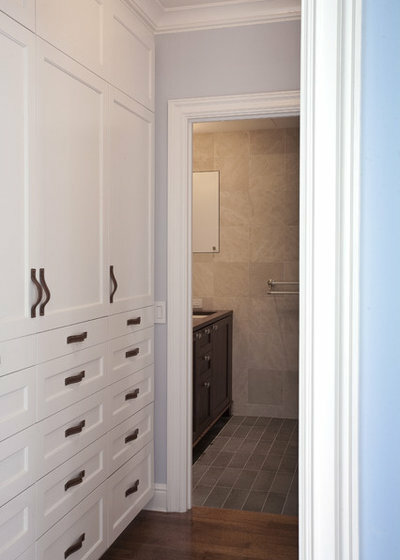 With easy access to the bathroom, this combination of closed cabinetry and drawers makes efficient use of hall space and provides ample linen storage. 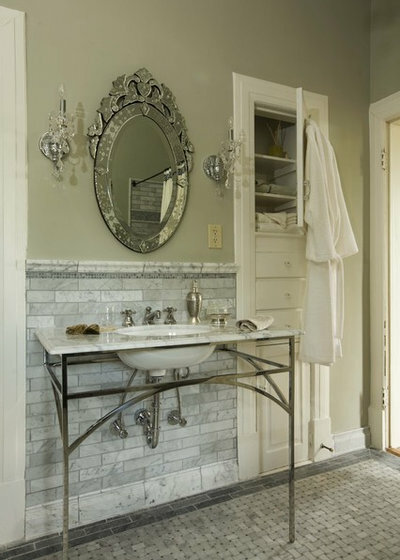 Retro-pretty, this mirrored cabinet is an aesthetically pleasing option to store bathroom necessities. 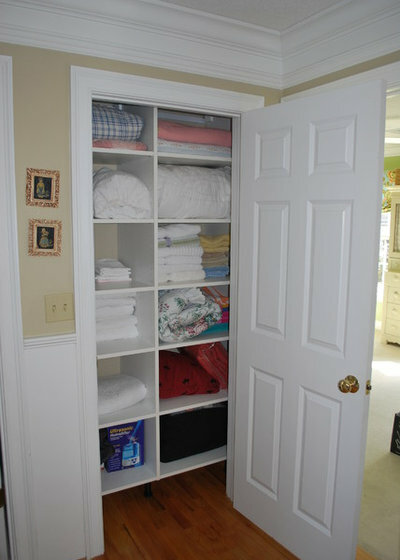 This linen closet features cubbies of different dimensions which help to keep unruly items, such as comforters, neatly contained. 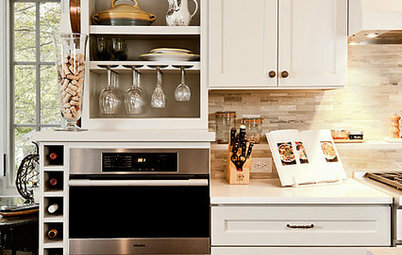 Have a glass front cabinet and worried that you might not be able to keep your linens display-worthy? 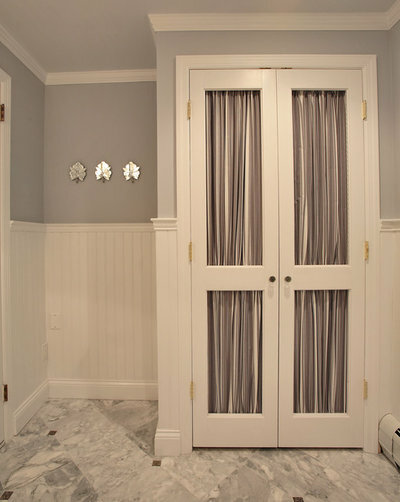 Try this little trick and add shirred fabric to the inside of the doors. Lacking linen storage? 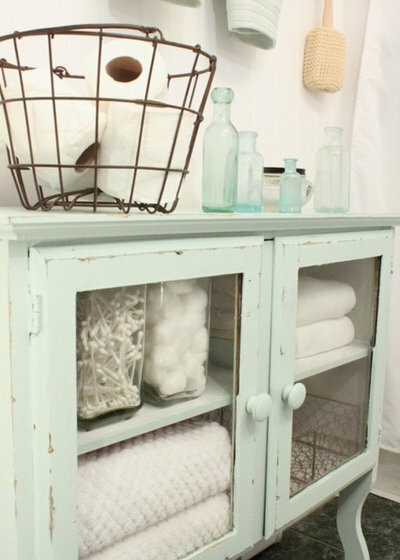 Try adding a pretty vintage cabinet to corral towels and other necessities in an attractive way. Built-in cabinetry, such as the unit pictured here, gives a hint of nostalgia and is clever enough to offer both hidden and visible storage. This pretty cabinet features a painted back that makes a lovely display out of needed storage. 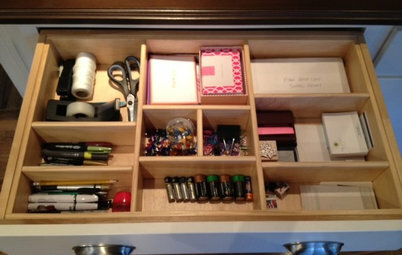 Try getting creative with your storage. 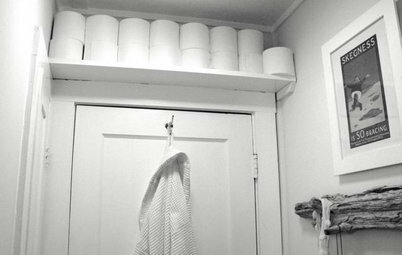 A wire basket corrals toilet paper while keeping it easily accessible for guests. 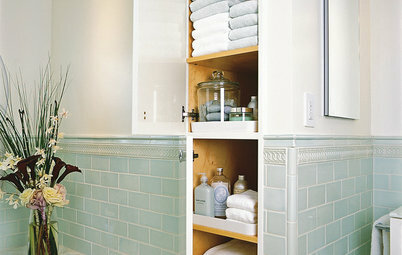 Glass apothecary jars are the perfect place to stash cotton swabs and Q-tips. Where to Keep the T.P. THANK YOU! the third pic is just what i needed to see. my new linen closet has plenty of shelving but also floor space i just assumed would be wasted, but putting castors on a legged basket or other container is a great idea and affords even more storage for out of season items. Thanks for including my photo in your ideabook! Now, where do you store the water pic and two electric toothbrushes in our small bathroom with just one outlet on wall above toilet?! 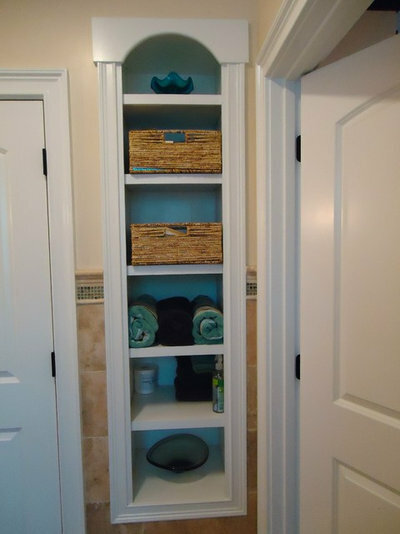 Bathroom Workbook Bathroom Storage: Where to Keep the TP?